What’s in the New Malaysia-Singapore Maritime Dispute Freeze? The move spotlighted efforts by both sides to try to manage renewed disputes within their wider bilateral relationship. Last week, the foreign ministers of Malaysia and Singapore agreed to what effectively constitutes a freeze or pause in an ongoing maritime dispute. The effort represented just the latest effort by both sides to de-escalate the situation and recalibrate their wider ties in 2019, following a series of renewed disputes that had rocked the bilateral relationship last year. As I have noted before in these pages, Malaysia and Singapore, neighboring states that were in fact unified during a brief period from 1963 to 1965, have long had a rather prickly relationship. Despite some significant improvements in ties over the past few years, old, unresolved problems, including on boundary issues, still tend to arise in ties from time to time in part due to domestic politics. Late last year, disputes re-emerged over issues including air and maritime boundaries, specifically around Malaysia’s announced extension of the limits of the port of Johor Bahru, which was rejected by Singapore, and Malaysia’s protests on the publication of Instrument Landing System procedures for Seletar Airport. 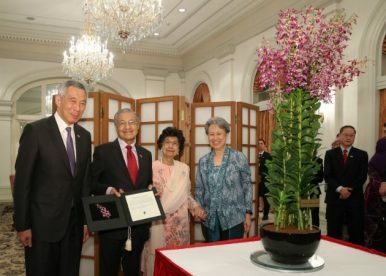 As I noted then, those disputes occurred as both countries were recalibrating their wider relationship amid domestic political changes, with Malaysia’s government under returning Prime Minister Mahathir Mohamad looking to shape its foreign policy following a shock election win in May 2018 and Singapore preparing for a gradual transition away from current Prime Minister Lee Hsien Loong (See: “Why Are Border Disputes Rocking Malaysia-Singapore Ties After Mahathir’s Return?“). Since then, while both sides have continued to express concerns about lingering disputes from their own perspectives, they have also reiterated a commitment to dialogue and have been working to manage these issues. In January, when the two foreign ministers met in Singapore, they agreed to establish a working group led by the two foreign ministries to further study and discuss the ongoing maritime issues surrounding the port limits of both countries, with the group reporting back within two months. Last week, following the initial findings of this working group, the two foreign ministers met in Malaysia and agreed to what effectively constitutes a temporary freeze or pause in the maritime issues surrounding the port limits of both countries. Per a joint statement issued following the meeting in Putrajaya on March 14, visiting Singapore Foreign Minister Vivian Balakrishnan and his Malaysian counterpart Saifuddin Abdullah agreed to adopt five recommendations in the working group report, including mutually suspending the implementation of their overlapping port limits for the time being. The temporary freeze is not without significance. The move, along with a range of other agreed terms – including not anchoring government vessels in the area, not authorizing and suspending commercial activities in the area, and operating in the area in accordance with international law – is meant to provide time and space for de-escalation, dialogue, and potential next steps. In an indication of what those next steps could include, both sides have also moved to establish a committee for boundary delimitation to both ensure implementation of the aforementioned steps and also to potentially commence negotiations for maritime boundary limitation in the area within a month. While the extent to which progress can actually be made remains to be seen, this interim road map nonetheless provides some sense of direction. At the same time, this temporary freeze or pause ought to be kept in perspective. A temporary easing of the maritime dispute issue lowers the temperature for the moment but does not really get to the heart of the issue that led to the flare up in the first place. Furthermore, it is important to keep in mind that the maritime boundary represents only one of several issues the two countries have with each other, with others including water prices and their air space. Additionally, even as both sides prove adept at addressing these issues at the working level, the broader challenge is the realignment of ties amid domestic political change that is still continuing, which will affect how leaders and politicians will manage these matters as well into the future. This is not to dismiss the importance of a freeze. Indeed, given the state of tensions in ties previously, such steps are no doubt welcome for the time being as the two countries work out their differences and minimize the risk of further escalation or conflict. Whether they can move beyond that to actually resolving some of these underlying issues and manage the wider challenges at play in the broader relationship, however, remains to be seen. What’s Next for the Malaysia-Singapore Pedra Branca Dispute? A look at where the issue is and where things are headed. Malaysia-Singapore Relations in the Spotlight With 2017 Leaders’ RetreatMalaysia Deploys First Warship to New Naval Base Near Disputed IslandThe Danger of Najibizing Malaysia’s Foreign PolicyWhat Does the Pause in Singapore-Malaysia Airspace Tensions Mean?Is New Malaysia’s China-US Balance Changing Under Mahathir?